This time we had a pleasure of talking to Jason who represents oiltradinggroup.com (OTG for short). It is a group for traders where professionals with deep expertise share their knowledge for free as well as trading insights for a reasonable membership fee. Jason stood out for us as an experienced trader with to-the-point advice on trading stocks and futures. His story also provides a cutting edge on a successful trader’s life. Dive in. Hi, Jason. Thanks for agreeing to this interview. To start, we would like to ask you to give our audience a little perspective on your work and how you do it. We [OTG] have been providing day trading educational services for almost 9 years (in October 2018). Our primary objective is to provide educational tools and services for novice traders and experienced traders alike. We have what we call a trading edge, we have one philosophy. So if you take a step back and say that every trader has one objective, it’s going to be “success”. Not every trader defines success as another trader will but at the end of the day when we all sit down to do this job called trading we all wanna be successful. So we all agree we all want to be successful. But the way to achieving success is to have a trading edge. With those two things in mind, we now get to the point when you start talking about trading setups. Trading setups are as unique to individuals as are people trading them, right? You may like going short in the area or I might think that it’s a break up to go long. Eventually we can look at the market in the same way but once we are getting to the trade it’s either winning or losing. Regardless of your statistical information (you may have backtested it, you may say that this trade is accurate), 72% to 28% of the time it’s not accurate. And this may be that time. Even if you break-even, it’s still a small loss due to commissions. We provide you the tools and indicators that would allow you to be able to understand when to get in and how to ride that trade. In a nutshell, we help traders with what they define a success and an edge. Preferably, they come to the table with tools like Bookmap that then can correspond to and complement the tools that we provide. If you roll it all up, that’s the services that we provide. An Email of Gratitude from one of the OTG members. How did you come up with this? I bet you’ve been a trader for a long time before helping others. Just to give a historical background for me, I had 2 professional mentors in my life: one was in a previous job that I had, and another was a trader. Back when I was a young man, around 30 years ago, I joined the US Navy and was in the military for a few years. Once I got out of that, I went to school and later got an entry-level job. At the time I left that organization 15 years later, I became the Vice President of Operations of this place and I had a mentor that helped to get through it. Well, I had to lay off and I wasn’t responsible for doing it. But I said that I never wanna do that again. I don’t wanna be in that position again: work in an industry for 15 years and something happens — in this case, it was 9/11 and we were a travel-based business. After 9/11 people were afraid to travel, and that what caused the lay-off. So I started dabbling with day trading while with time I got more serious about it. Eventually, I’ve met a floor trader, a friend of mine, who traded on the floor for 30 years. I was in this process that he began to provide me with information and training that helped to evolve as a trader. Hm, it’s an interesting observation. As we talked to other traders, it is some sort of a calamity that influenced their decision to become a trader. Yeah. You know, it’s funny you say this too because there were two places that my Travel organization worked with but one of them — Franchize.org — was the largest franchising travel agency system in the world. One of the things that they said was that it is best for them when the economy is negative because then people go out and wanna become entrepreneurs and they wanna take matters in the hands, and at last control their future. When the economy is doing well, people feel safe and comfortable. So to support what you just said, it doesn’t surprise me to hear that traders act in the same way. When something is going on in their life that propels them out of the comfort zone to do something like this. Totally agree with you. But you know, not everybody is ready to take that risk. Some people prefer to wait until the good times come. So do you believe that prospective traders are made different? Here’s what I think: you don’t learn it until you done it. But in some case, it is too late. Trade can help you learn a lot about yourself so if you have a tendency to be an aggressive risk taker, it’s going to show up in your personality. Also, if you are an engineer type and everything must follow a logical pattern — if this happens, then I must do this — you can struggle a little bit because you can’t show the market. Even though you did everything step by step according to your strategy, it may still not work out. So what trading does it really exposes your personality flaws and forces you address these issues so that you can be successful. It’s an interesting perspective. But before we go on, could you please tell us about other instruments you traded before organizing your trading group? Sure, I traded currencies for a little while — forex. But since the forex market is more active, it didn’t fit my personality because I want to be able to watch my trade. I can’t go to sleep while I can trade it, which is open around the clock. I was up all night, with only a couple hours of sleep, and I’d do it across the week which was a bad fit for my personality. So gradually I was moving to futures because they have a very specific start and stop time during the day — extended trading hours or regular trading hours — and during these hours you can do all you need to get done so this fits my personality well. My time, 8 in the morning, until 10:30 — so about a 2.5-hour window I can get things done. So I’ve traded different instruments this way: gold, and oil, and ES. I found that the latter two fit my personality best. Got it. It is also the reason why “Oil Trading Group”, because you understand this instrument well, right? Yes, that’s exactly right. Because I have a good feel about crude oil and it just happens to fit my personality as I said. Support and Resistance: Decision Points (Location). Do you read the financial news? Where? I don’t spend a lot of time with financial news. Occasionally I read company analyses and I am aware of announcements that are coming out, but I am a price-action trader. So as such, I’m trying to be sensitive to what prices tell me. If otherwise and I go read financials news or what other traders are doing, it has a tendency to give me a bias which might be not right at that moment. I try to avoid external influences like that. I am aware of announcements and crude oil inventory reports, but on ES we stay away from nonfarm-payroll reports. Generally, I try not to be based on someone’s editorial opinion. A bit off-topic but what do you think of Fake News? Just from a pure, personal standpoint, I do feel like that people form their opinion based on what they read online. In fact, sensational headlines on Twitter and Facebook get shared quickly. From a trading perspective, I am not really affected since I do not do a fundamental analysis and more just look at what prices are doing on my chart. If the price is going to be responding to some stimuli like the fake news or article that comes out, I’ll be able to understand what price is doing, and react accordingly. So, do you just follow the flow? Yes. Basically, the backbone of what I do is what we call the decision points in trading. So when the price has hit some sort of a confluence in the past, or maybe it’s a Fibonacci retracement, but we find these places on the chart where we expect the market to do something: either to continue in one direction or turn in another. When the order flow comes in, buyers and sellers are going to accumulate around these important areas. So by possessing tools like Bookmap, we are able to identify our decision points and we can begin to watch how the buyers and the sellers are responding when prices and people concentrate at a certain level on a chart. When you combine these two things together, they can become very powerful tools. Agree. I bet many people ask you this question but what if a lot of people are waiting for these same decision points? For example, they are looking at the same Fibonacci extension or other indicators waiting for others to make a decision. That’s what the market is. The market is a groupthink. As the herd starts to move — whether it’s instituted by a single person or by a group or organization — everyone is going to follow the suit. I absolutely believe there is an impact of that but that’s why you get choppy movements all the time: it can go up and go down, and go up and again down. Or stay in the same range for a while. But ultimately there would be some catalyst. If you look at statistics, 80% of the time the market is sideways and only 20% of the time it’s breaking out. That’s because people are gathering and forming their opinion until there is a catalyst that moves the market. So if you are sensible to these changes, you have the ability to react and go with the flow. To sum up: you are waiting for a catalyst and then jump on the flow train. As soon as it goes in a different direction you quit; you don’t allow yourself losing a lot. After you are out, you prepare for the next trade, correct? That is correct. We look at it like this: once you get into a trade, there are only two things that are going to happen: it’s either gonna win, or it isn’t. So if you have a small stop and the market rotates and rotates, and rotates, and you don’t get stopped out and the trade is fine but if you do get stopped, it’s a small stop. As an example, in today’s trading session I had 3 trades: 2 of them were losers and 1 a winner. The one winner got back all of my losers plus a few ticks. The point of it is that even with a 33% win rate I was better off because I did a right risk-reward in play. So once you get in a trade, that’s the key and the most important thing: if that works you ride for as far as you can, and if not — you get out as quickly as you can. Since you mentioned risk and reward, could you please advise what is the right strategy? We look at 2 to 1 strategy: for every dollar you put at risk, you have a $2+ reward. More is better, obviously. Our initial targets are about 4 to 1 and we use trail stops to protect 2 to 1 as quickly as we can. Again, if we put $100 on one of the CL trades, we aim to make at least $200. 50 Period SMA Filter – Crude Oil (CL). *Laughing* I like every other trader that have ever traded — with a few exceptions. When I first started out, I had more money than cents and I would get in and lose a lot of money this way, blowing up accounts, and all of those things. What keeps you from being successful in my opinion is not learning what success is in trading. I worked for a company for 25 years before I became trading. I would go in every day and I would sit down at my desk and I would these things called work and at the end of every 2 weeks I received a paycheck for sitting there. When I became a trader, it was not the way it worked. You can sit for days and lose money. Therefore, you have to get that mindset correct as a trader in order to get over the next hurdle to become successful. Here’s what I mean. It took me years when I sat down and said: “I got to make money today.” Doesn’t matter what the number is but I had this task to make money whenever I started trading. Sometimes you can do everything properly and the market just doesn’t want to cooperate. In the end, this is why you have to put all these parameters. If your parameter is “I got to make money today” and you are not in sync with the way the market is acting, then you keep trading until you blow up your account. So the #1 job that we teach at OTG is not to make money. The #1 job of a professional trader is to preserve the capital. The #1 job of a trading setup is not to make money. The #1 job of a trading setup is to find a position on your chart that will provide you with the least amount of risk and a maximum amount of reward. 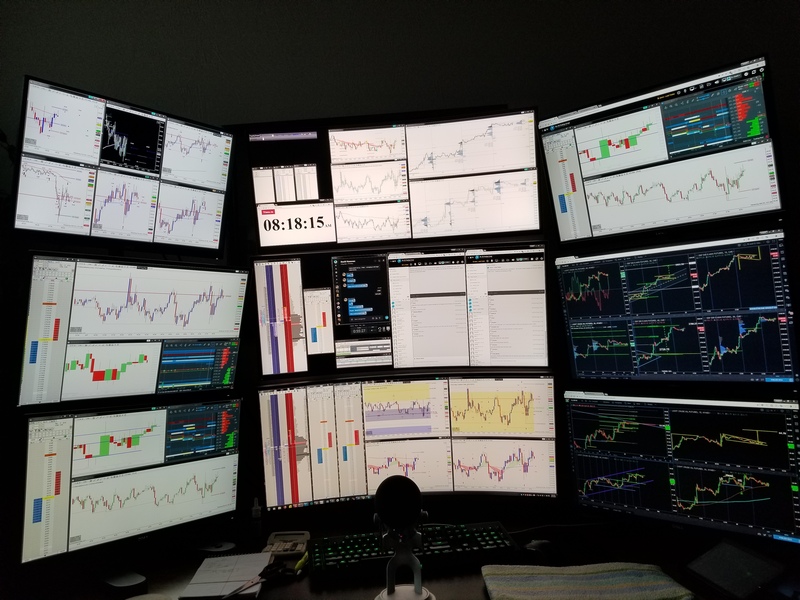 The second job of a trading setup is to make money. When your objective is to preserve your capital, in our opinion, you will be a lot more successful quicker if you adopt this approach. Really good advice, Jason. What we also hear from other traders during Trading Depth interview series is consistency: they talk about strategies you have to stick to and preserving your capital. *Us laughing too* Perhaps, it is for good because if they get in trouble at the beginning when the stakes are not so high, they most likely will learn. You know, you are exactly right. One of the things we talk about is school: in the US, if you want to work at a high position — CEO, CFO, an aircraft pilot — you have to study a lot. This would cost you between $100,000 and $300,000, not including residency and other costs. For trading, people believe all they need is a laptop and $5,000 in their account. But most likely people will spend money on the things they don’t need, like indicators that would not work for them. In reality, trading education is not free. Although it differs from standard education, it has a different form which involves practice. While working with traders, we tell them about the psychology of trading and that it takes time. It reminds me kids going into cryptocurrency: while bitcoin rises, everybody feels like a genius; but it’s different when the price is unpredictable. How does your family react to your vocation? Initially, there was not a lot of excitement and I did not do very well at the start. I’ve been trading for 15 years at this point and it’s just my job now. They know it. They just got used to it, right? Yeah. I’m home a lot and get to be around the family. I often visit the baseball games of my son. So I am very positive. My mom who is 72 years old still quite doesn’t understand what I do *laughs* but for the most part, the family is very supportive and now it’s dad doing his job. Congratulations on that. But does your son or his peers have some stereotypes about traders — like “it’s all about luck” and so on? Trading is hard enough psychologically. And your family keeps repeating that “nobody ever wins doing that,” “you can’t win long-term,” “it’s just gambling” — judging the things they don’t understand. But when you think about problems that are going on in the world, they have much to do with a perspective of another person. Similarly in trading: if you don’t know how to become successful in it, then you make snap judgments. It influences your psychology. I’m fortunate enough to not have it but I know people who have. Putting the market aside, family support can make a difference for sure. So far from what I heard during our conversation, you don’t believe in luck. Yes, not for long-term success. You get lucky occasionally: you know, my stop was here and it missed me by a tick. Or bad luck happens. However, those are only instances of luck. If you want to be successful in a long-term, trading is not about luck. It’s about statistical probability and the edge. The example that I use with my guys is a casino. The casino has a statistical advantage over you. You go there, play cards or slot machines — if you play 24/7, you are going to run out of money because the statistical advantage is in their favor. And this is what you as a trader need to know: how to turn statistical advantage in your favor. What should people know about trading Oil? One of the reasons that I like trading oil is that there are very specific things that repeat on a daily basis. One reason traders get impatient or they overleverage during the volatile moves is because they don’t know when the market is going to do something. 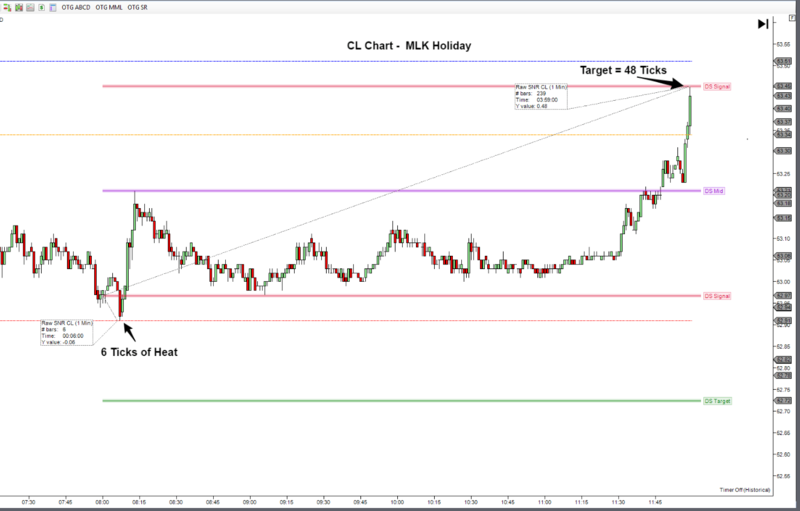 A couple of tricks for the CL if you will: buy the low for the week — 98% of the time it’s made up on Monday or Tuesday. On Thursday usually a pull-back happens after rallying all week, and then on Friday, it’s a reversal pull-back. Also, between the hours 1 am and 4 am Central standard time the London session will make a high or a low and that would be the high low for the day about 70% of the time. So if you sit down and analyze this information, you can build up your context which is important. It’s an anchor that supports your analysis. And the third thing: between 9 am and 10 am CST there is a swing that occurs in that area every single day for about 70 to 80 ticks. So a swing low or a swing high reversal. What you are looking for is either market rallying into that zone — and you try to find support and resistance — and then you would look for a sell-off. Or reversely the market is coming down by the time you get into that area into the support area and the market would rally. These three things will give you a chance to sharpen your pencil and kinda look for opportunities. Thank you, Jason, these are indeed valuable pieces of advice. What about (E-mini) ES? Well, it’s not as predictable in terms of time and day but it does have a day retracement point that it likes to hit. If you look at a daily chart, the halfway point of Fibonacci extension is like 61.8% and 70.6% and the market would often get right in the middle of that zone and then rezone the direction it was heading to. So for example, if the market has been rallying and starts to sell off, look for that halfway point between those two bids, the market will stop on a dime and go the other direction. That is something we’ve watched for quite a bit on ES as a potential trading point. It doesn’t happen every day or any couple of days but when it happens it is extremely powerful and it’s a great place to watch for potential trading opportunities. Do you debrief your trading sessions? Why? Yeah, I do personally. However, there are situations when I do everything as planned but the market just does not want to cooperate. Then, debriefing isn’t really helpful. Can you name three sins of a trader? Traders who don’t respect the risk will end up being hurt. Traders who don’t follow their rules will end up being hurt. Traders who don’t plan ahead of time, also will not succeed. So these are rather obvious but important factors that successful traders do. If you don’t, you have a problem. Not managing your risks, moving your stop and other sins will jeopardize your profitability. But traders don’t like to lose. We don’t realize the loss until we hit the stop. In fact, a stop is such an important component to your trading because you will get wiped out. So if you trade without respecting your stops, sooner or later it’s gonna eat a part of you. After working with people for a long time, what would you recommend so they actually stick to this recommendation? Actually losing money and learning from it or some alternative? I would always recommend to trade a simulator and treat it as real. Don’t mess around: if you are not going to trade $100,000 and you don’t possibly have this amount in your account, then don’t simulate it. If you are going to trade $15,000, set up your simulator at $15,000 and treat as if it’s real. That’s the best advice I can give: do the things you would do and then you let the muscle memory — practice — work. Sometimes you hear people saying: “Well, I don’t like simulators because there is no real money and it’s not motivational at all.” I think this is just nonsense, an excuse. Don’t be lazy; get in there, get into simulator and trade it like you would trade it in a real time. Once you become successful, then you can transition to real money. Most trading platforms will provide you with a trading simulator. 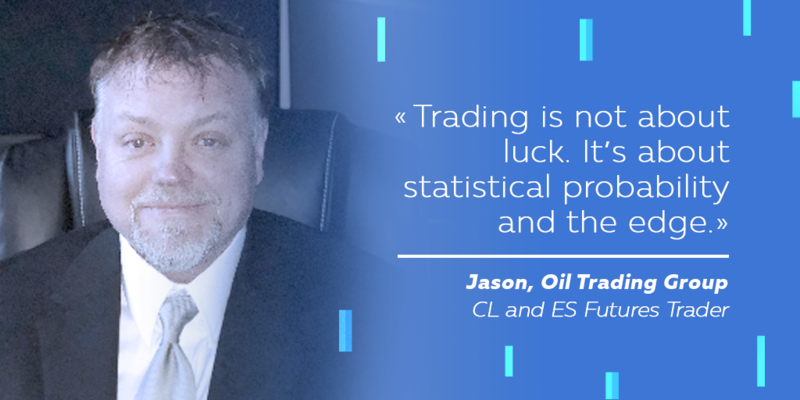 Regards to Jason of the Oil Trading Group for telling his story and sharing trading insights. 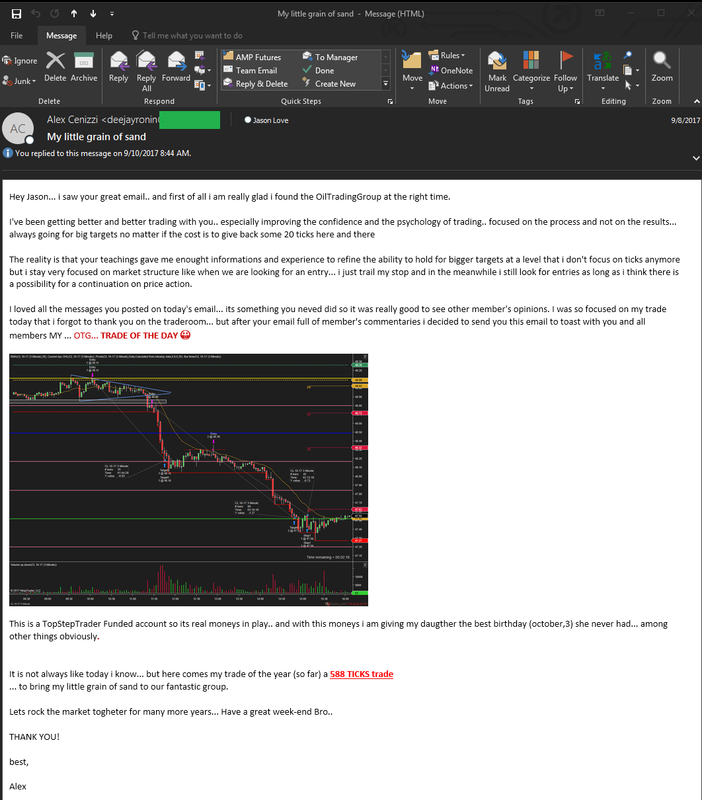 Let us know if you liked it in the comments below and share with other traders. This set-up is primarily used as a 3-bar pattern, fade technique. 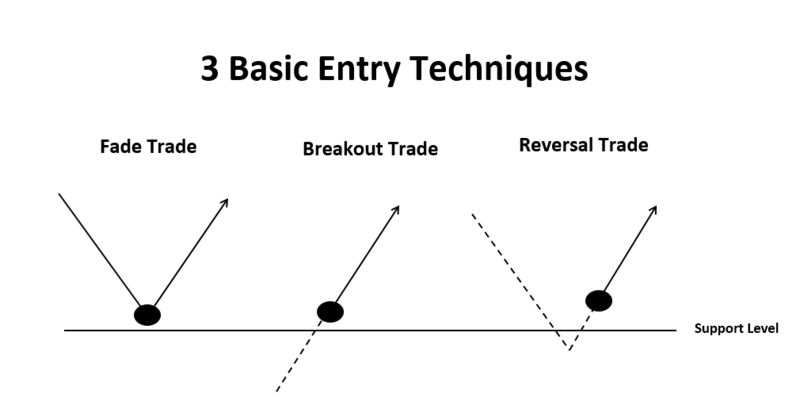 However, in some instances, it can be used as a breakout or a reversal entry. 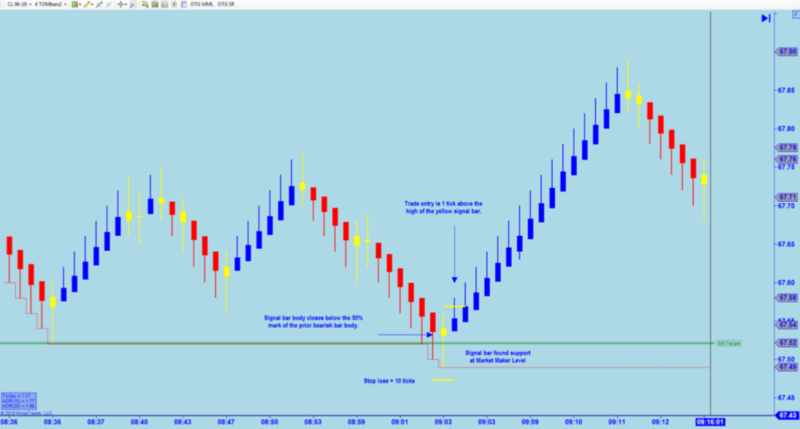 Bar Type – The indicator is using a set of hybrid Renko Bars. 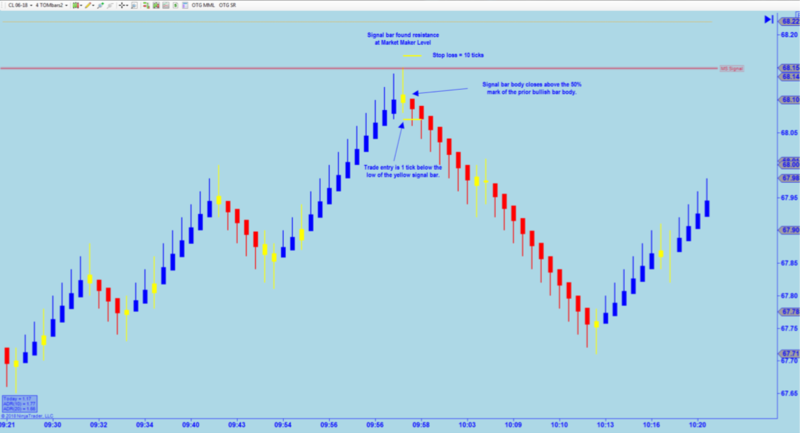 The primary difference between Renko Bars and traditional candle sticks is that the Renko Bars are not time-based. Time-based candle sticks reflect price action based upon a “fixed” time frame; i.e. 5 minutes, 15 minutes, etc. 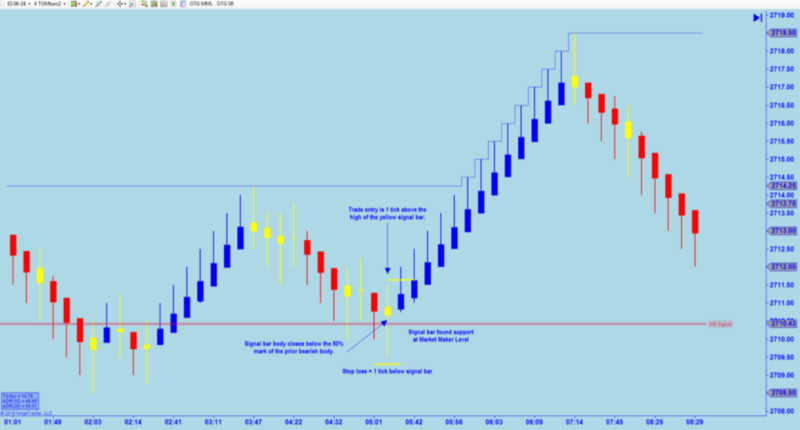 Renko Bars form new “bricks” when the criteria for change has been met. So, for the chart we will be trading in the room, the “brick” will be set to 4 ticks. Simply put, when price action goes 5 ticks away from the open of the bar, a new “brick” will be printed, regardless of the amount of time it takes for that to occur. 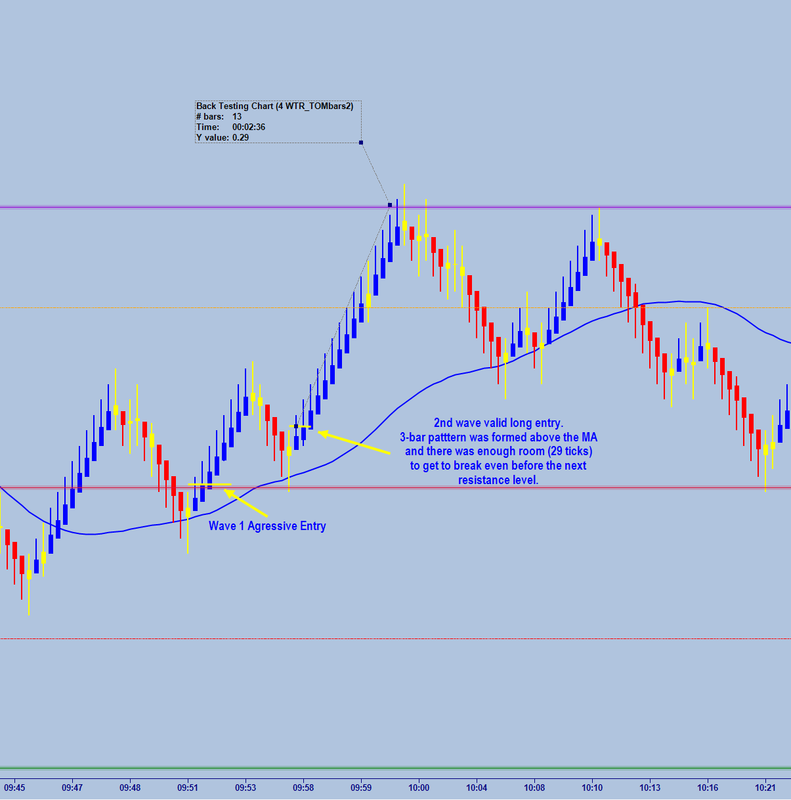 For more information on Renko Bars click this link. Colors – For “bullish bars” the color is blue, for “bearish bars” the color is red. The “signal bar” is yellow. 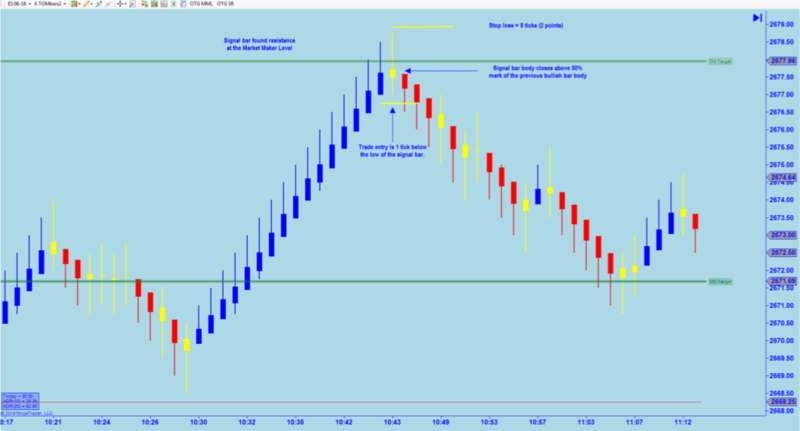 Renko Modification – There is one additional modification to the Renko Bars in this indicator. Once a bar has been printed, the true “open price” is not reflected on the bar. In other words, the high and the low of the bar is accurate, but the candle body has been modified in a way to reflect the prevailing direction of the market. Bar prior to the signal bar is blue (bullish). Signal bar (yellow) finds resistance at a Market Maker Level or another majorresistance point on your chart; i.e. previous session high, Asian range or London sessionhigh. Also, you can use pivots, fib levels and/or chart patterns. Signal bar (body) should close above the 50% mark of the prior bullish (blue) bar body. Entry is one tick below the signal bar; preferably a bearish bar. However, this is not required but is preferred. To anticipate your entry, when the signal bar is forming, you will need to calculate 8 ticks from the top of the signal bar and the entry will be 1 tick below the signal bar. This is for a 4 Tick TOM Bar. If you use a 6 Tick TOM bar then you will need12 ticks from the top. Just double the range and add a tick for entries. Bar prior to the signal bar is red (bearish). Signal bar (yellow) finds support at a Market Maker Level or another major resistance point on your chart; i.e. previous session high, Asian range or London session high. Also, you can use pivots, fib levels and/or chart patterns. Signal bar (body) should close below the 50% mark of the prior bearish (red) bar body. Entry is one tick above the signal bar; preferably a bullish bar. However, this is not required but is preferred. To anticipate your entry, when the signal bar is forming, you will need to calculate the low of the bar and your buy stop entry 9 ticks above the low of the signal bar.